Amatrol’s Mechatronics Ethernet Learning System – AB CompactLogix L32 (87-ENAB53) covers the applicable skills and theory for EtherNet industrial communication networks used on automated lines in areas such as automotive, manufacturing, and packaging. 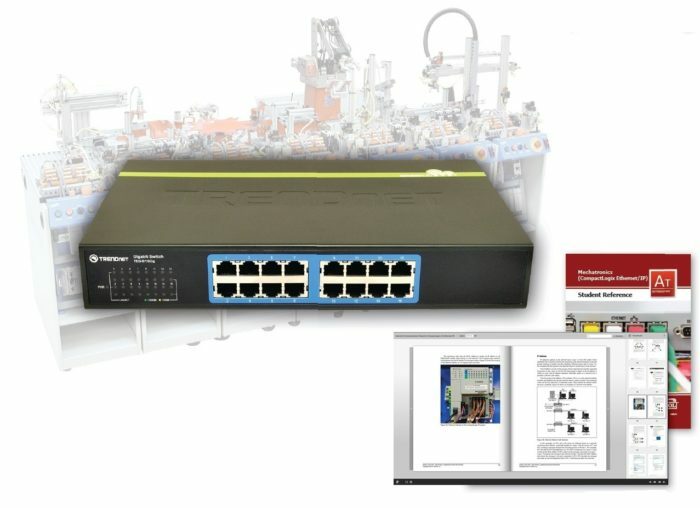 Used in combination with a PC and two or more of Amatrol’s world-class mechatronics learning stations, the 87-ENAB53 covers major EtherNet topics such as network operation, installation, and configuration, data transfers between controllers, produced and consumed data, and using the message instruction. The 87-ENAB53 teaches how an EtherNet switch interfaces with programmable logic controllers to control and monitor an automated line. This learning system allows learners to practice industry-standard skills by interfacing two or more Allen-Bradley CompactLogix 5300 L32 PLCs. Some of the real-world, hands-on skills that learners can practice include setting the IP address of a 1769-L16ER CompactLogix controller, configuring an MSG instruction to transfer data between ControlLogix controllers, and creating a User-Defined data type in a ControlLogix project. EtherNet is the most popular plant-wide communications network because its high speed, reliability, and open framework enable connecting equipment from multiple vendors. The 87-ENAB53 includes a 16-port EtherNet switch, and eight 14-ft. EtherNet cables. Learners will practice hands-on skills such as configuring the EtherNet/IP driver using RSLinx software, creating a Consumed tag in a ControlLogix project, and transferring data between controllers using produced and consumed tags on EtherNet/IP. This integration will allow learners to gain hands-on experience with how EtherNet/IP is used to communicate with and monitor multiple devices simultaneously. Study and Perform Real-World EtherNet Operations! Amatrol provides world-class curriculum with each of its learning systems. The 87-ENAB53A allows learners to explore a wide array of EtherNet topics to gain a strong grasp on the foundational knowledge necessary to understand the function of EtherNet industrial communication networks. Within this curriculum, learners study topics such as the hardware used for an EtherNet/IP, the tag structure for an EtherNet/IP Remote I/O network, two types of data transferred between controllers, configuring controllers to produce and consume data, and configuring the Message instruction. The 87-ENAB53 is used in combination with a PC and two or more of Amatrol’s world-class mechatronics learning stations featuring Allen-Bradley CompactLogix 5300 L32 processors. For the maximum learning experience, this learning system provides enough ports to connect all seven mechatronics stations, a PC, and eight additional EtherNet devices. A sample copy of the Mechatronics Ethernet Student Reference Guide is also included with the system for your evaluation. Sourced from the system’s curriculum, the Student Reference Guide takes the entire series’ technical content contained in the learning objectives and combines them into one perfect-bound book. Student Reference Guides supplement this course by providing a condensed, inexpensive reference tool that learners will find invaluable once they finish their training making it the perfect course takeaway.